Meet Dr. Estefanía Rodríguez, an underwater expert at the American Museum of Natural History. You probably don’t know much about the lowly sea anemones, the colorful and vegetal-looking animal that plentifully cover the ocean floor. You’re not alone; even marine biologists have little understanding of these nearly alien creatures. New York being New York, though, you can be sure that we have an expert on everything, including sea anemones. That expert is Dr. Estefanía Rodríguez. 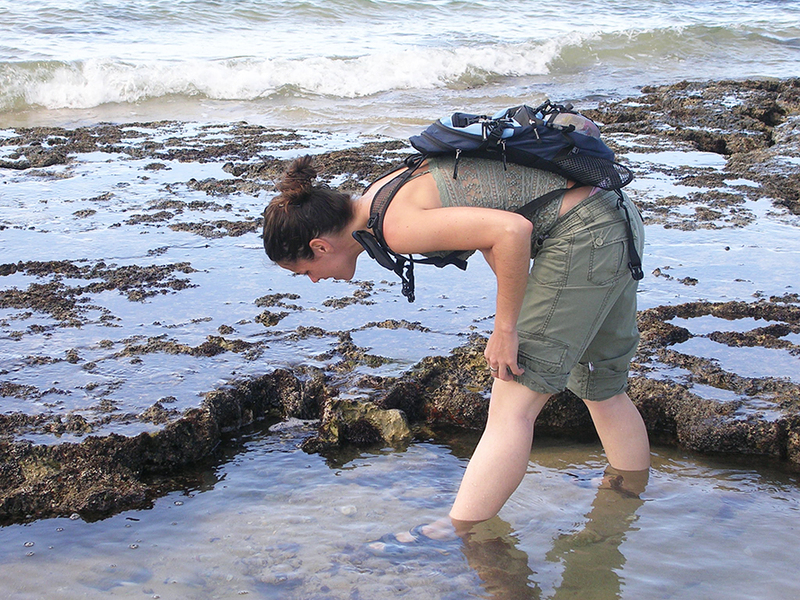 Rodríguez is a systematist (a scientist who studies the evolution and diversity of species) who specializes in marine invertebrates, specifically sea anemones, at the American Museum of Natural History (AMNH). Her research appears in the museum’s exhibition “Unseen Oceans,” which explores the ocean floor with computer simulations, aquarium tanks with live sharks, fascinating deep-sea video, and a look at the technology that has made access to these previously inaccessible depths possible. We spoke with Rodríguez about discovering a new order of animal (say what?) and the life of an associate curator at AMNH (how cool is that?). What Should We Do?! : Was there an “aha” moment when you knew that marine invertebrates were going to be your professional focus? Estefanía Rodríguez: I was snorkeling at a stone beach in the south of Spain when I realized I had to learn more about the wonderful and definitively different underwater world. While getting my Ph.D., I visited a lab in Brazil and started my extended study into sea anemones, which I expect will be what I work on for the rest of my life. I never really connected with the terrestrial invertebrates: insects, spiders, and centipedes. They are fascinating from a biological point of view, but I have to admit that I still find them a bit creepy-looking! WSWD: What is it about the sea anemone that holds your attention? Rodríguez: Biologically, anemones are relatively very simple animals. They only have a couple of layers of cells to make up all the necessary parts they need to live and yet their diversity is incredible. They come in all these spectacular forms and shapes and have many different ways of eating, reproducing, and moving. Also, when they are alive, they are so beautiful. WSWD: I hate to ask, but have you ever had an opportunity to taste them? Rodríguez: People do eat them; they are on menus in coastal European and Asian countries. I tried them once, but there was something about the texture that didn’t agree with me. Maybe I just felt sorry for them! Obviously I like sea anemones, but I also have a fondness for owls and sea slugs. WSWD: Where do you have to go to find a sea anemone? Rodríguez: Sea anemones live in every marine environment on the planet and they are extremely understudied. My specialty is in Antarctic sea anemones, and I have been fortunate enough to travel to Antarctica several times. Being there means that you are isolated in an immense, quiet white space where it can always be day and it is always cold. What might surprise you is that when you look in the water out there, you see so much life and it comes in so many colors. There are certainly new species there that we simply don’t know about yet. WSWD: What are the greatest misconceptions you find people have about what you do? Rodríguez: I’ve had people say they thought that I studied “amoebas from the Arctic.” Wrong pole and wrong group of animals! WSWD: You contributed to the discovery of an entirely new order of sea anemone in the Pacific Ocean. How did you make that breakthrough? Rodríguez: As with many scientific discoveries, it came as an unexpected surprise. I was working on a new natural classification for sea anemones using molecular biological tools that allow you to explore living things on a genetic level. A deep-sea animal that, at the time, we were calling the “giant sea anemone” kept grouping outside the rest of the anemones. After multiple analyses, we finally had to conclude that this over-six-and-a-half-feet-long creature was not a sea anemone and that, in fact, it actually represented an entirely new order of animals. That is a rare thing to uncover, even more so when you consider how large and relatively common that creature is. It’s a sign of how little we still know about life in our oceans. WSWD: What do the animals you study have to share that can benefit people? Rodríguez: In the larger sense, anemones are part of the food chain in the sea and therefore a crucial element of the marine ecosystem and environment that we depend on to live. More directly, many studies seeking new compounds useful in medicine and technology are focusing on the biological and chemical makeup unique to anemones and other marine invertebrates. The problem is that we know so little about sea anemones that we are probably missing a lot of the potential direct benefits they have for us. I hope my research can help change that. WSWD: Are anemones your favorite animals? Rodríguez: As a biologist, I find all animals to be amazing in their own way. Obviously I like sea anemones, but I also have a fondness for owls and sea slugs. WSWD: Describe your perfect New York day. ER: I would go to Central Park for a walk and a picnic, then an early dinner at Land Thai Kitchen, a show at Jazz at Lincoln Center, and a drink somewhere in Williamsburg. Looking for the perfect spot to eat after viewing “Unseen Oceans” at the American Museum of Natural History? Get in touch for our Upper West Side recommendations or download our app.